Tyco Extension cables use a pair of Tyco male/female quick-connectors on each end. Extension cables are used between PV arrays to connect together a string with Tyco connectors. 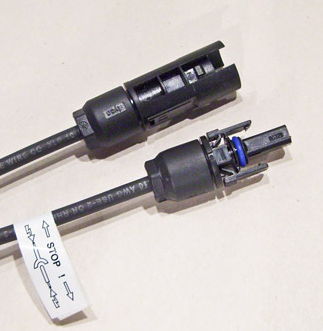 An extension cable can also be cut in half for a male/female cable pair with bare copper wire on the opposing ends for connecting a string of panels to a grid-tied inverter or combiner box. For example this 100’ cable extension could be cut in half for a 50’ male/female pair used to connect a string of panels to an inverter or controller. Made with black #10 AWG USE-2 sunlight resistant cable. Compatible only with Tyco connectors, check your module spec sheet to confirm the connector type. Most modern panels use MC4 or Amphenol but some older panels will require Tyco connectors.